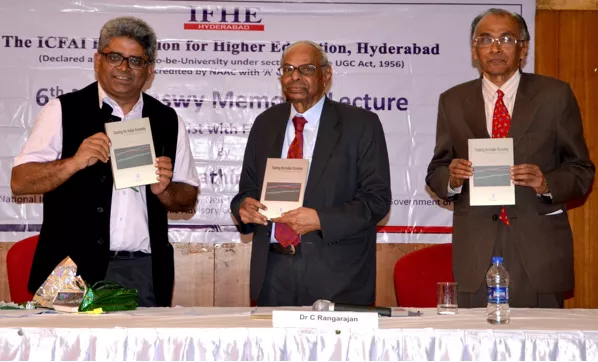 6th N J Yasaswy Memorial Lecture organised at ICFAI Foundation of Higher Education (IFHE), a Deemed University of ICFAI, Hyderabad. Director and CEO of the National Institute of Public Finance and Policy Dr. Rathin Roy as the Chief Guest of the event. The event was presided by Dr. C. Rangarajan, former RBI Governor, former Governor of undivided Andhra Pradesh and chancellor of IFHE. While addressing the event, Dr. Roy spoke about “The Need to Persist with Fiscal Consolidation”. He highlighted the need for fiscal prudence on the government’s part, in various fiscal decisions like borrowing, and spending, and managing the fiscal targets. He described an interesting similarity between alcoholism and the tendency to borrow in the name of public expenditure, which could result in deviation from the fiscal targets. Dr. Roy also shared his views on the Fiscal Responsibility and Budget Management (FRBM) Act 2003, and its significance in reducing India’s fiscal deficit. Dr. Roy stressed on the need to act with judiciousness in fiscal policymaking and implementation. Dr. Rangarajan punctuates the need for prudence in fiscal spending and pointed out that most of the government’s funds, in the name of public expenditure, were spent towards the revenue expenditure instead of capital expenditure. This, according to him was not a wise move, as it led to the larger fiscal deficit with proportionally lesser public good. Referring to the 1991 and the 2008 financial crises, which were largely due to the laxity in fiscal prudence Dr.Rangarajan stated, “Sometimes History offers very important lessons to learn”. The event was inaugurated by Dr. J. Mahender Reddy, Vice Chancellor, IFHE. In inaugural address, he captured the snapshot of life of late N J Yasaswy and his eminent contributions to research and academia. The ICFAI Foundation for Higher Education (IFHE) is a Deemed University under Section 3 of the UGC Act, 1956. 5,200 students are pursuing various programs in the Faculty of Management (IBS Hyderabad), ICFAI Tech School and ICFAI Law School at the University. IFHE is accredited by NAAC with ‘A’ Grade with an impressive score (institutional CGPA) of 3.43 out of 4. ICFAI Business School (IBS) is a constituent of ICFAI group and was incepted in 1995. Since then it has been providing quality business and management programs and is one of the pioneer B -School in India. ICFAI Business School provides globally accepted programs and 100% case-based learning. In Ahmedabad, Bengaluru, Gurgaon, Kolkata, Mumbai and Pune campuses, they provide PGPM program and at Dehradun, Hyderabad and Jaipur they provide MBA programs. Provide MBA/PGPM and Phd programs.